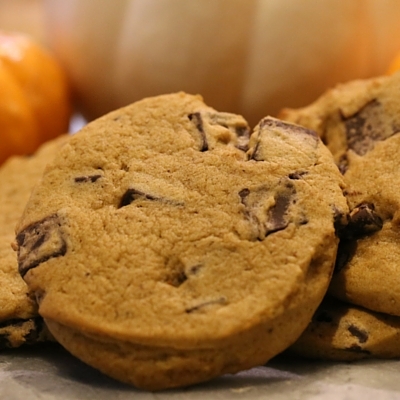 Pumpkin paired with chocolate chips just makes the cookies taste great! This is an awesome treat that will keep you wanting more. Preheat the oven to 350oF. Grease two cookie sheets, line one with wax paper. Blend the baking soda, baking powder, salt, spices and flour in a bowl. Cream the butter with both the sugars in the mixer. Gradually add in the vanilla, puree and beat on high. Add in the dry ingredient blend and mix well. Use an ice cream scoop to drop the cookies onto a wax paper. Refrigerate the cookies for an hour in the fridge. Place it on the cookie sheet about 2 inches apart, and flatten it. This cannot be done without refrigeration as the cookie dough is very sticky. Remember, these cookies do not spread, so you would need to press it down to spread it out as much as you want. Bake it for 10-12 mins. BAKING CHIPS, CHOCOLATE, SEMI-SWEET, PUMPKIN, CANNED, BUTTER, SUGAR, FLOUR, BROWN SUGAR, FLAVOR, VANILLA EXTRACT, SALT, GROUND CINNAMON, BAKING POWDER, BAKING SODA, GROUND NUTMEG, GROUND CLOVES.